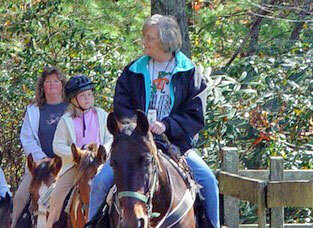 Horse lovers will have the time of their lives at the Adventure Park at Five Oaks 1 Hour Trail Ride in Sevierville, TN. This 70-acre facility is located in the midst of the scenic Smokey Mountains across from the Tanger Five Oaks Outlet Mall, so you can combine your horse riding adventure with a shopping extravaganza. You can relax in the knowledge that all the horses at the Five Oaks Riding Stables are well-trained and experienced in both the expected route and having many different riders. Five Oaks Riding Stables features friendly horses that all ages will enjoy. You can take their picture and pet them to your heart’s content. Nature lovers will thrill to the sight of whitetail deer, wild turkeys and other area wildlife as they ride the beautiful horses up the trail. The area is home to more than 60 kinds of animals and more than 200 kinds of birds. The hour-long ride is complete with a guided tour leader that will ensure all participants have a safe and enjoyable trip. Children age six and up are allowed to participate in the horseback trail rides. Rides last approximately 1 hour. Helmets are available to riders upon request. Patrons should dress appropriately for the weather and for horse riding. I love riding horses. This was great!